Clyde Dee is an anonymous psychotherapist with over twenty years of experience who works in an inner-city mental health facility. Raised in a private school, he sought refuge in a ghetto community to hide a history of anorexia. Working his way through, Clyde has learned to champion the untold story. One day he hopes to help revolutionize treatment for "psychosis" across diagnostic divides. 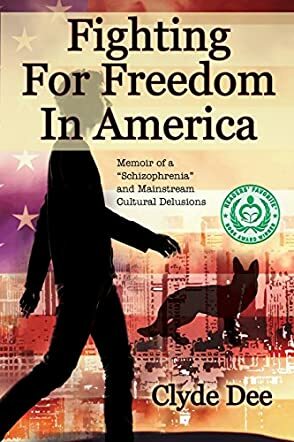 Fighting for Freedom in America: Memoir of a "Schizophrenia" and Mainstream Cultural Delusions by Clyde Dee is a non-fiction book that focuses on some of the harshest realities of life. Clyde Dee was a mental health counselor when his life was turned upside down. Taking a job at the Section 8 housing project was perhaps the worst (or the best) thing to happen to him. Embroiled in politics and games, his life becomes increasingly difficult when he is incarcerated in a psychiatric ward. After three months, he comes back to the real world as a changed man. But he is homeless and jobless; however, he has the will and strength to face down his fears and conquer them. Now he has empathy for the mental health patients and how they survive day after day. Clyde Dee is such an inspiration for people who deal with mental health issues day after day. This book would be informative and very encouraging for people who are either suffering from mental illness or who treat people with a mental illness. For an average person like me, it was insightful and instructive. I finally understand what a person with a mental illness feels like, lives like, and how he fights for his sanity and his life every single day. You cannot help but feel their pain and hope for the best. Life is very tough and the way Dee described it, things are even harder for the mentally ill. This book has compassion, passion, understanding, and a force of will that will allow any person to become better and make peace with themselves. Great job.